Brief Description of Subject: Jesus with a shepherd’s crook in one hand and a lamb across his shoulder. This window was the first to be installed and dedicated. The plaque beside this window is a little ambiguous, but the window probably was donated by Nora Wright in memory of her husband Clarence and in honor of their marriage. Nora was an active member of Circle Two of the Women’s Fellowship, later known as Virda May Circle. She was very supportive of Women’s Fellowship and Mayflower Church. 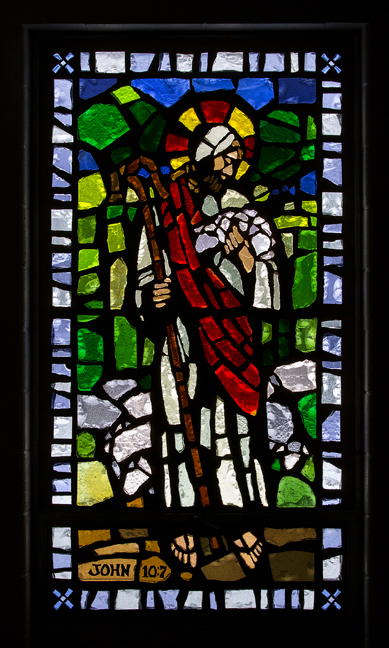 The window shows Jesus as the Good Shepherd, one of the traditional and classic descriptions of Christ. Jesus stands at the center of the window, holding a shepherd’s crook in one hand and carrying a lamb across his shoulder. He looks gently at the lamb. This image of Jesus as Shepherd with the believers as his lambs was so prevalent in the early church that it gave rise to the language describing pastors and bishops as under-shepherds to the Lord’s flock. The shepherd’s crook became the bishop’s crozier, a staff signifying the office and role of overseer. There are many other references to shepherds in the scriptures. Shepherds near Bethlehem were told by angels of the birth of the Christ Child. David, the great King of Israel, was a shepherd watching his father’s sheep when Samuel anointed him to be king. David is traditionally considered to be the author of many Psalms, including the Shepherd’s Psalm (Psalm 23). Abraham. the father of Israel, had many herds and flocks as did his sons Isaac and Jacob. The prophet Amos was a shepherd in Tekoa, and many prophetic writings use the imagery of sheep and shepherds. Installed Nov. 20, 1975, and dedicated Nov. 23, 1975. Artists Richard Hanley and Mark Taleba. Installation by Omnibus Studios, Okemos, MI.